The Granite Gurus: FAQ Friday: How is Granite Priced? 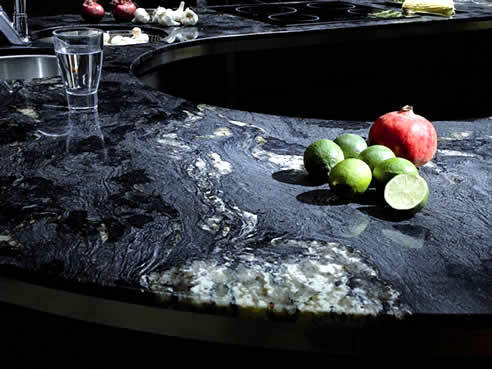 FAQ Friday: How is Granite Priced? Most stone suppliers group granite colors from 1-5, "group 1" being the least expensive and "group 5" being most expensive. Each group represents a price category only. The groups are determined by how available a stone is in the market, somewhat similar to how gemstones are priced. Don't let the # 1 scare you, it has nothing to do with the quality of the stone. In fact, sometimes the lower priced granites are the best quality stones. Below is a picture from our portfolio of a "group 1" granite called Giallo Ornamental. It does not matter to us what group you choose your stone from, we will fabricate it the same way. However, the group of stone you select will have a direct reflection on your per square foot cost. Labor is a pretty set cost, it's the granite colors & upgraded edge details that will cause your square foot price to fluctuate. Below, the Cosmic Black granite is a "group 5". Note: Please keep in mind prices vary drastically in different areas of the country, per supplier and per fabricator. For example: Giallo Ornamental is a "group 1" granite here in Utah when you buy from us. I've heard in other parts of the country it's as high as a "group 4". Please understand I just talk about pricing that is applicable in our market here in Utah. Fantastic info. I had assumed the categories had something to do with quality. Good to know it's really Econ 101: Supply and Demand! I wish all distributors grouped granite into price categories. I've found some that do, but some do not. Choosing colors and then getting pricing from a fabricator later is the one thing that has caused the most delay in choosing a color. I went back and forth trying to find colors in the right price range. The best experience I had was at a distributor that gave me a paper upon arrival with all colors listed in price categories. Very interesting. So my question is whether customers buy material (be it granite, marble, quartz or other) by the square foot or by the slab. Does this vary depending on the fabricator? And if you buy by the slab are the leftovers the customers? And what about the sink hole; whose is that? For "Group 1" granite you are paying by the square foot. We own any extra material. For anything above Group 1 you pay for the slabs. We let our customer's have the leftover pieces if they want them. Sink holes aren't worth as much as people think. They don't come out perfectly round or square due to how our CNC machine cuts them. We let our customer's have them if they want but they have to pay extra if we cut them to size or polish the edges. Otherwise they get recycled.